Crepes have a reputation for being complicated to make, but if you can scramble an egg, then you can make homemade crepes or blintzes. It takes a little practice at first, but once you get the hang of handling the batter, you should be able to turn them out with ease. 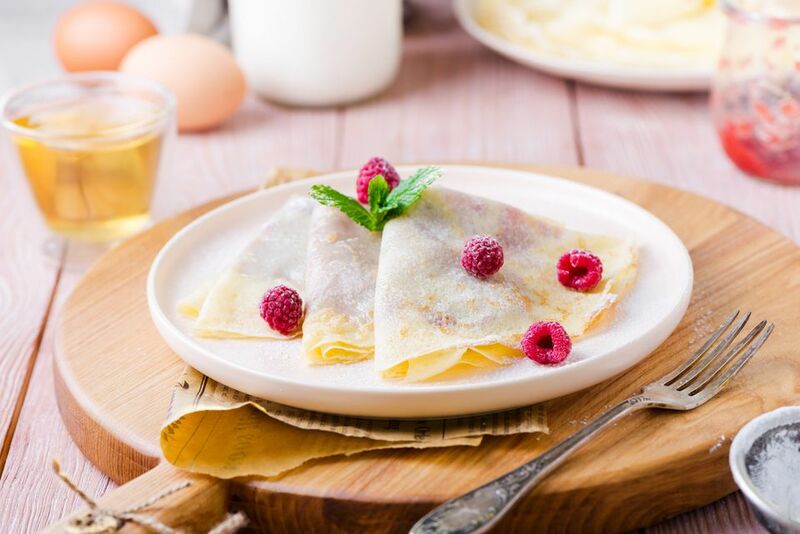 Best of all, crepes are wonderfully versatile—you can fill them with a wide range or sweet or savory fillings for a quick snack or an elegant meal. In a large bowl, whisk together the eggs and milk or soy milk. Whisk in the flour, salt, sugar, vanilla (if using), and butter until the batter is smooth and lump-free. Alternatively, place all of the ingredients in a blender and puree until smooth, about 15 to 20 seconds. The batter will be thin. Allow the batter to rest for at 5 minutes before using. Lightly oil a crepe pan or nonstick skillet (cast iron works well). Warm the pan over medium-high heat. Pour about 1/4 cup of crepe batter mixture into the center of the hot pan, then immediately lift the pan and rotate your wrist so that the batter spreads into a thin round. Place the pan back on the heat. Alternatively, you can leave the pan on the heat and spread the crepe batter with the bottom of a small ladle. Start in the middle of the batter, and gently move it in a widening circular pattern until the batter spreads. When the edges of the crepe start to pull away from the side of the pan and the top looks set, slip a spatula under it and carefully flip the crepe. Cook until the underside is slightly browned in spots. Transfer to a plate and continue making crepes until the batter is used up, stacking them as you go. Fill the crepes with your choice of filling. Fold or roll them over the filling any way you want. While you can substitute water for the milk in a pinch, the crepes are tastier when made with milk or a dairy substitute, such as soy milk. Sugar and vanilla are optional additions but are especially nice if you're making dessert crepes. While you can make the crepes right away, it is preferable to allow the batter to rest, covered in the refrigerator, for at least 1 hour, and up to a day in advance, before using. Whisk the batter again before cooking the crepes.